Hong Kong, January 15, 2019 - The Asia Horse Week will be held again this year for its second edition and will host several conferences on different subjects: breeding, welfare, sport and horse education from February 14 to 16. Featuring a "Clean Sport" seminar in partnership with the FEI and several renowned speakers, the Asia Horse Week is now an essential event for the equestrian community in Asia and is full of surprises. Driven by this persistent desire to develop the equestrian world in Asia-Pacific, Christophe Ameeuw and his EEM team, in partnership with the Hong Kong Jockey Club and with the support of the Hong Kong Tourism Board and the Wall Street Journal, have taken up the challenge of setting up this leading forum on the Asian continent, which, combined with a professional horse show, forms the Asia Horse Week. The first edition was welcomed by participants as well as leading figures of the horse industry such as Ingmar De Vos, President of the International Federation, the German athlete with the most medals in equestrianism, Ludger Beerbaum. This year, the FEI is partnering with this unique event to present its "Clean Sport" seminar. A perfect opportunity to raise awareness and familiarize Asian equestrian industry professionals and the equestrian community with the ethical and regulatory issues and best practices to promote healthy and responsible equestrian sports. The seminar will be led by Göran Akerström, FEI Veterinary Director, and his colleague Caterina Termine. Different subjects will be addressed, including FEI Clean Sport, limb sensitivity detection, biosecurity and international movement of horses, FEI Prohibited Substances List and current regulations, avoiding a positive sample, contamination and feed supplements. Riders, breeders and professionals from all over the world will be present to discuss these issues, with the focus on a common concern: horse welfare. That subject will be addressed in most of the conferences of the Asia Horse Week 2019 program. It is indeed a key topic at all levels of the equestrian world, whether in sport, industry or breeding. Topics more specific to the Asia-Pacific region will also be raised, such as the development of sport in Asia or the recent performance of regional riders. The training, health and fitness of horses will also be among the major themes addressed in this second edition. Renowned speakers will travel to Hong Kong from February 14 to 16. The master of ceremonies will be Alex Hua Tian, the Chinese Olympic rider. In particular, he will present the progress of his "The Horsemanship Movement" program, for which he recently received the FEI Solidarity Award. Paul Schockemöhle, a real horse man who has excelled not just in sport, but in breeding and business as well, will also take part and present his innovative concept of breeding, which has brought him success and renown at the highest international level, both in dressage and show jumping. Roly Owers, Chief Executive of the "World Horse Welfare" association, will develop the link between the equine industry and horse welfare, while Soenke Lauterbach, Secretary General of the German Federation, will present the unique model of its functioning, as well as his vision of breeding and the evolution of the sport. Prof. Cesare Galli, veterinarian, founder and director of Avantea, founder and president of Fondazione Avantea Onlus, founder of Xenothera S.A. (France) and Equigea (Florida) will talk about embryo transfers from top-level sport horses. His presentation will lead into The Auction by ARQANA - Act 1, an innovative sports horse sales program created by Christophe Ameeuw's association and ARQANA, the number-one racehorse auction agency in France and among the leaders in Europe. This first act will present a collection of 20 embryos from remarkable strains such as: Emerald, Chacco Blue, and For pleasure for stallions, and Regina Z, Hera van't Roosakker, and Coriana van klapscheut for mares. 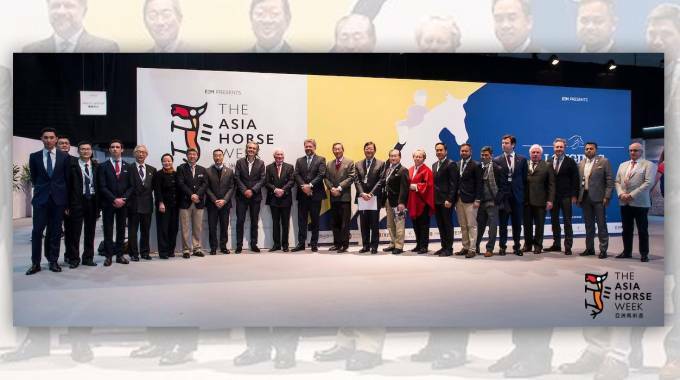 In summary, speakers – riders, renowned breeders, and major players in the equestrian industry – from more than forty different countries will lead these many conferences during the Asia Horse Week. This event promises to become both a benchmark and, more importantly, an exceptional opportunity to meet and discuss a subject that brings together personalities from all over the world: the horse. From high-end saddlery with Butet, CWD and Ikonik, to outfitters such as Kingsland, Horse Pilot, Harcour and Lamicell, the leading brands will be represented on the exhibitors’ side. Belgium and France will even be in the spotlight: each will be present in a pavilion of its own colours where visitors will have the opportunity to meet the emblematic equestrian companies of both countries. Horse breeding and sales won’t be overlooked, with the presence of the Stud-book Selle Français, the GFE, the BWP, Fences and The Auction. This second edition of the Asia Horse Week promises to be richly colorful thanks to the various conferences and seminars, as well as the exhibitors’ village, all within the prestigious framework of the Longines Masters of Hong Kong. Save the dates of February 14 to 16, 2019.